Codex Bobbiensis (designated k in critical editions) is an important relic of the Old Latin versions of the Bible which were in use for nearly two hundred years before Jerome produced the Latin Vulgate. Bobbiensis is dated by most critics to about the year A.D. 400, though some have dated it a century later. By its similarities to the biblical quotations found in the writings of Cyprian of Carthage, critics have concluded that the manuscript represents a form of the text which prevailed in the African province during his lifetime, in the third century. Unfortunately, the manuscript is only partly preserved. It contains the latter half of Mark's Gospel (from chapter 8 to the end) and the first half of Matthew (up to chapter 15). Below are the descriptions of the manuscript from the introductions of S.P. Tregelles, F.H.A. Scrivener, and Bruce Metzger. Click on the image at left to see an enlarged view of one especially interesting page of the manuscript. S.P. Tregelles, An Introduction to the Critical Study and Knowledge of the Holy Scriptures, 14th ed., vol. iv (London: Longmans, Green and Co., 1877), p. 239. Codex Bobbiensis. -- This MS. like the other literary treasures once at Bobbio, has been removed from the monastery from which it takes its name: it is now at Turin. Its date is considered to be the fifth century. The extant portion contains parts of the Gospels of Matthew and Mark. The text had been copied and edited by Fleck with his accustomed inaccuracy: it was retranscribed by Tischendorf, who published a portion in the Wiener Jahrbücher . Tischendorf speaks of the text of this MS. as though it belonged to the "Itala;" it ought rather to be considered as representing a peculiar revision of the Old Latin, in which there is an evident use of a Greek text more Alexandrian than that which had been the original basis of the Latin version. It has besides many peculiarities. Passages are abridged in a manner which seems arbitrary. In places, the conclusion of Mark's Gospel for example, k. preserves in Latin readings which we know independently to have been very ancient: it may thus be regarded as a type of text which would have been of very great value if it had come down to us more free from the changes made by copyists; but even as it is, and with all its imperfections, it has great value, especially in places in which it supports the reading of a few of the best and oldest Greek MSS. It is to be regretted that Lachmann only knew the readings of k. from Fleck's most incorrect edition. F.H.A. Scrivener, A Plain Introduction to the Criticism of the New Testament for the Use of Biblical Students, 4th ed., edited by Edward Miller, vol. ii (London: George Bell and Sons, 1894), p. 48.
k. Cod. 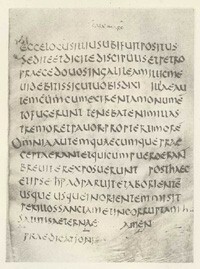 Bobiensis [v or vi], now in the National Library at Turin (G. vii. 15), whither it was brough with a vast number of other books from Bobbio; traditionally asserted to have belonged to St. Columban, who died in the monastery he had founded there, in 615. This MS. is perhaps the most important, in regard to text, of all the Old Latin copies, being undoubtedly the oldest existing representative of the African type. It contains Mark 8:8-11; 8:14-16; 8:19-16:9; Matthew 1:1-3:10; 4:2-14:17; 15:20-36; the order then was probably John, Luke, Mark, Matthew. It was edited by F.F. Fleck in 1837, and by Tischendorf in 1847-49; but so inaccurately by the former and so inconveniently by the latter as to be little known and used by students. It was finally edited by Bishop Wordsworth (1886) as No. 2 of the 'Old Latin Bible Texts,' with full introduction, and with a dissertation on the text by Professor Sanday. B. M. Metzger, The Text of the New Testament: Its Transmission, Corruption, and Restoration, 3rd ed. (New York: Oxford University Press, 1992), p. 73. The most important witness to the African Old Latin is codex Bobbiensis, to which the symbol k has been assigned. Unfortunately, it is quite fragmentary, containly only about half of Matthew and Mark. It was copied about A.D. 400 in Africa and brought to the Irish monastery of Bobbio in northern Italy, where it was preserved for many centuries until it found a home in the National Library at Turin, where it is now. Its form of text agrees very closely with the quotations made by St. Cyprian of Carthage (about A.D. 250). According to E.A. Lowe, k shows paleographical marks of having been copied from a second-century papyrus. It is noteworthy that k contains the intermediate ending of the Gospel according to Mark.